Tomorrow morning I will finally face the music. I've been listening to it (or rather feeling it) growing louder: six months ago it was pianissimo, but in the last week or so it ramped up to forte. I thought I was done with this particular concerto; but as it turns out, dentists are not infallible, and the two wisdom teeth my dentist said would never even descend did in fact come in. I suppose the technical term is "erupt," but that puts me a little too much in mind of cataclysmic explosions--not exactly what I want to think about on the eve of the surgery to have them out. And that's what this is all about, this business of putting up a post about chocolate when I would otherwise be writing about apple muffins. (But fear not! That post is coming, probably next week.) In preparation for having a couple of teeth yanked, I have been all a bustle in the kitchen. Cool, soft food is the order of the day, so in addition to stocking up on ice cream, I've been making applesauce and pudding. Two kinds of pudding, actually: rice pudding and, as is probably obvious from that leading image, chocolate pudding. I don't recall what made me think of chocolate pudding as good post-op fare; but as soon as it occurred to me, a switch was thrown, and it was all I could do not to rush home from work at that very moment to make it. I hadn't even decided on a recipe yet. 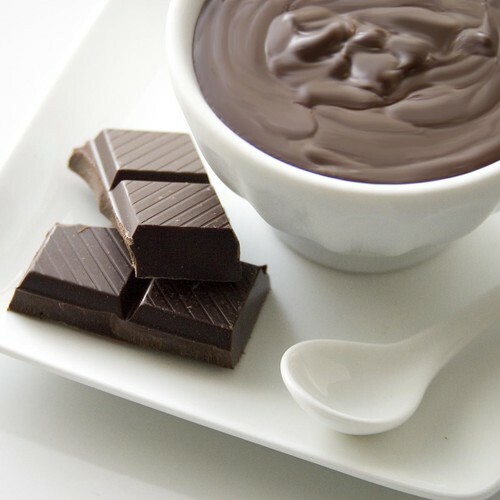 I poked around a bit, and there are plenty of chocolate pudding recipes out there, but most of them didn't quite hit the spot. I wanted something creamy, slightly eggy, and richly chocolatey. 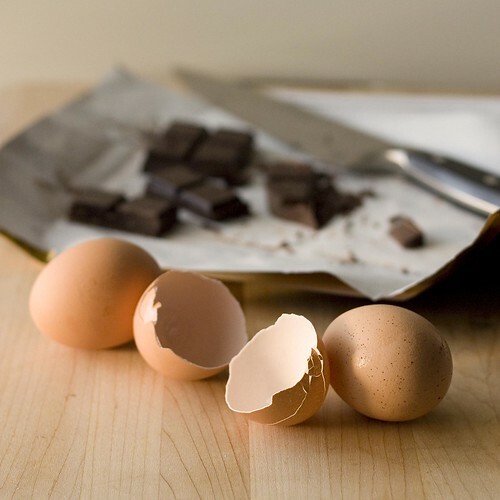 Eventually I settled on a recipe from Cook's Illustrated that uses not only chocolate, but cocoa powder; not only milk, but cream; and three egg yolks. It sounded like it might fit the bill. And indeed, it does fit the bill. Better than that, it's everything I was dreaming of in a chocolate pudding. The knowledge that I would be one very unhappy post-op patient if I ran out of pudding too quickly was the only thing that kept me from inhaling half of the batch before it ever made it into the little ramekins I had set out. I can't say that I'm looking forward to the having those teeth out tomorrow, but at least I'll have chocolate pudding waiting for me afterward. 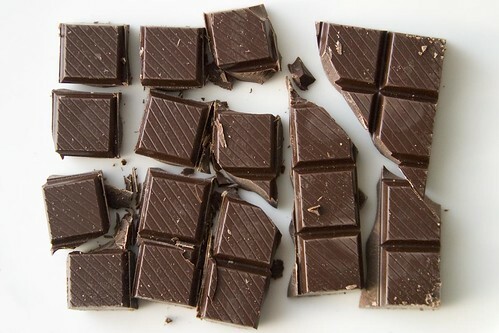 Place your chocolate in a heatproof bowl and set it over a pan of barely simmering water. Stir it periodically until it is nice and smooth, then set aside to cool slightly. Add the cream slowly, whisking constantly, and keep whisking until it is smooth. Add the yolks, whisk to combine, then whisk in the chocolate (gradually, if the chocolate is still very warm). Don't worry if the chocolate forms small lumps. They will smooth out as the pudding cooks. Set the pot over medium heat and cook, whisking constantly and being careful to scrape the bottom and sides of the pot, until the pudding thickens and darkens. Reduce the heat to medium-low, switch from a whisk to a wooden spoon, and stir the pudding gently as it keeps cooking. When the pudding coats the spoon thickly and reaches 200F/95C, it's done. This should take anywhere from 1 to 2 minutes. Place a fine mesh sieve over a medium bowl, and pour the pudding through the sieve. Use a rubber spatula to help it along. Stir in the butter and vanilla until the pudding is smooth. Serve the pudding warm or chilled. If you chill the pudding, placing a sheet of plastic wrap directly on the surface will help prevent a skin from forming. The skin doesn't change the taste of the pudding, just the texture of the top layer. If you can't find cornstarch, substituting flour should be fine. Just make sure that you cook it thoroughly so that the flour doesn't give the pudding a chalky feel. Ugh. I had all four of mine out in January. Stayed awake for it too... not at all pleasant and the aftermath is even worse. You'll be happy to have that pudding. I had made butternut squash and stocked up on yogurt, but I really didn't have an appetite for anything. I only ate so that I could take the painkillers. 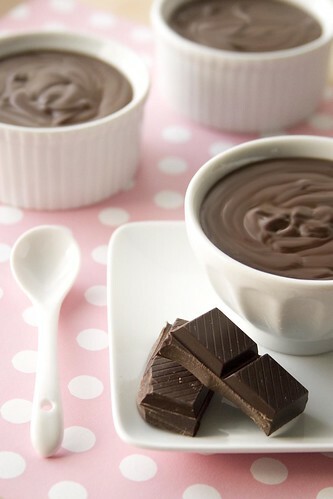 Chocolate pudding is a great idea. I'm sure it will make up for the whole unpleasant experience. Good luck! Ahh, your pudding looks so decadent and creamy. And I'm seriously in love with your photo skills. I know I say that every 2 seconds but you always amaze me! Hope the chocolate helps you heal quickly! Your pudding looks delicious!! so rich and creamy! I had 4 impacted wisdom teeth out in college. My mom made me tons of smoothies - put pineapple in them - the enzymes in the fruit allegedly help with the swelling....and also, its just delicious. Yikes, Megan! Sorry to hear you had such a bad experience. Alicia, I can't imagine having all four impacted! I think I got lucky this time around after a fair-to-middling experience with the bottom two. The surgeon I saw this time was excellent, and the recovery went much better than last time. I still didn't have much of an appetite for the first few days (like you, Megan, I ate so that I could take the pain meds), but now things are almost back to normal. Thanks for the well wishes, everyone! Alicia, I didn't know that about the enzymes in the pineapple. I was a little reluctant to have anything very acidic in my mouth, but I did have a smoothie that had a bit of pineapple in it. I love your photos to DEATH!